Here on our quilty adventure, we’re going to keep it cozy. It’s still December, for a few more days at least and if you missed the post on wool, turn back! It was so warm! Jersey is another fan favorite when it comes to warm and cuddly fabrics. Babies love it. Kids love it. I’m pretty sure everyone loves it. Except maybe… quilters. 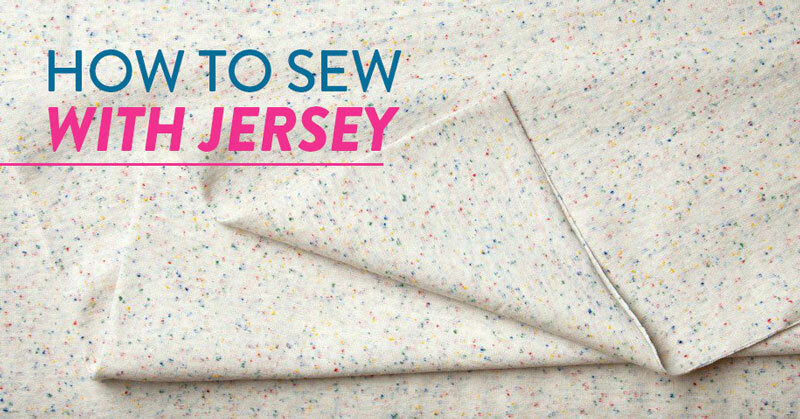 Jersey is a knit fabric, actually called weft-knit if you want to get fancy about it. “Jersey” has become a pretty loose term, referring to any knitted fabric without a distinct rib. The name itself doesn’t come from the Jersey in the United States, but from the name of an island off the coast of England. The fabric was actually used commonly for fishermen’s clothing, and the original jersey fabrics were a lot heavier than the jersey knits we know today. Jersey knits can be hand made (power to you! ), or made on knitting machines. Though you can’t see it easily on your everyday t-shirt, jersey knits are made from the same basic knitting stitch you would use to knit a scarf… just much, much smaller. It’s a lightweight, stretchy, comfy fabric that’s great for everyday use. So let’s use it, shall we? I know you’re worried about running into stretched-out seams and scary slippage when you’re out there on the jersey roads. But stretchiness doesn’t always mean poppin’ threads. Sometimes, it just means stretchiness. And stretchiness can be good! Where does all that stretchiness come from? Jersey is stretchy because it’s knitted (made with inter-connected loops) instead of woven, like cotton. The knitted method gives it that soft, all-seasons feel that you totally love, so don’t be hate'n on it. If you’re looking for cozy simplicity, jersey really delivers. As long as you know some of the local insider tips, you’ll be just fine. So, jersey’s kinda special, and there’s some special gear out there that can help you get the most out of it. There’s also some more high-tech stuff that basically no one has, but everyone wants when they’re sewing with jersey. I’ll talk about it, just so we can all be jealous and drool all over the internet looking at all the fancy stuff. Ballpoint ﻿﻿needles. If you'd prefer to skip the twin needles, ballpoint needles are another great option. Ballpoint needles have rounded tips that let you slip in between those knitted loops instead of barging right through the middle of the thread like a meanie. Respect your jersey knit, and it’ll respect you. A walking foot. Yah, you’ve heard this one from me before. They’re SO nice for working with stretchy materials! Just remember to get one that is compatible to your sewing machine. Use interfacing. If you don't want to mess with special needles, just stick with your regular Universal Needle and prepare your stretchy jersey by ironing some stabilizer to the back of it. I'm talking about some light-weight fusible interfacing such as this Pellon Shape-Flex. This stuff is really easy to use – just steam iron it to the back of your T-shirts. 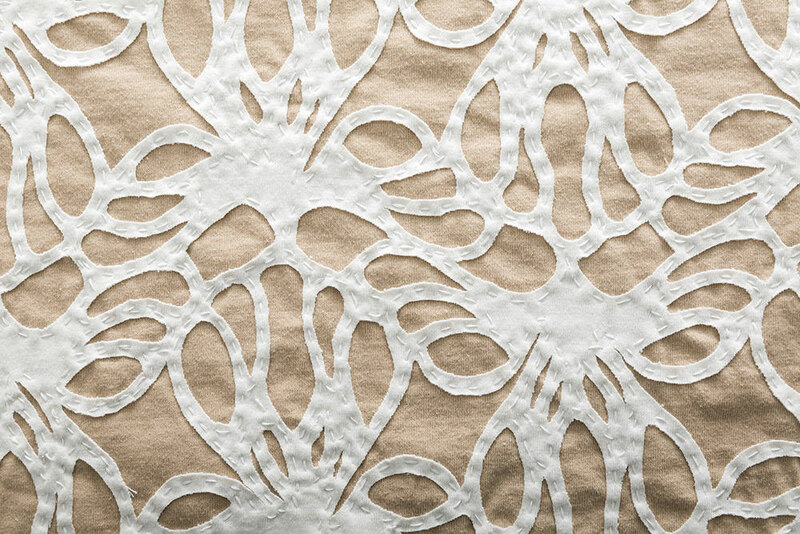 Because it's light-weight, it won't make your finished quilt feel crunchy. A cover stitch machine. A whole new machine, you say? Yeah. And it’s super cool. So, have you seen those commercially sewn jersey knit pieces with double-row hems? Cover stitch machines do this IN ONE STEP. So perfect. But don’t worry, you can still do it with a regular sewing machine. In more than one step. 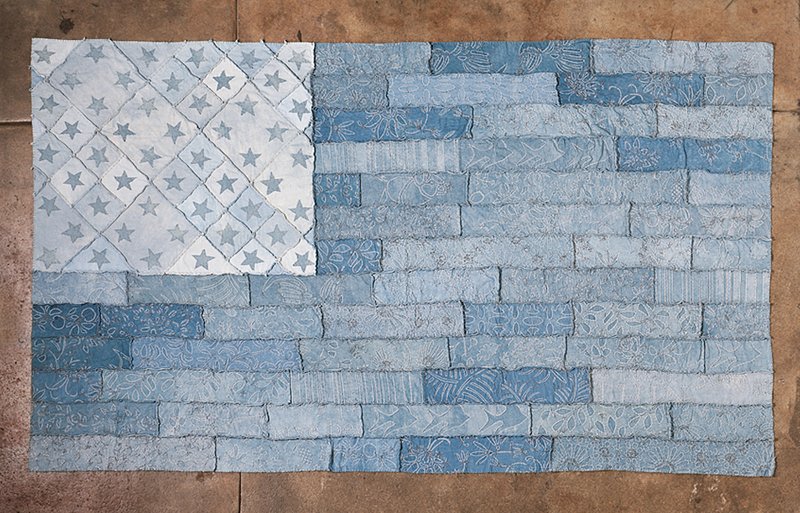 ​Hand-stitched indigo ﻿﻿jersey﻿﻿ quilt by Natalie Chanin. If you got ahold of a twin needle, try that out. You still get the straight look, but you have more stretch. Otherwise, try THE STRETCH STITCH! It’s a thing! It looks a lot like a lightning bolt, and the zig zag lets your jersey stretch like never before. So good. TSHIRT QUILTS ARE NOT THE ONLY JERSEY QUILTS. ​Let me give you a minute to pick your jaw up from off the floor. Back in your chair? Good, cause you're going to want to hear about this. Natalie Chanin, founder of Alabama Chanin in Florence, AL almost exclusively uses 100% organic cotton jersey in her designs.​ If you hop around on this website, one phrase you see often is "slow design." Each item created is slowly and deliberately crafted with sustainability in mind. 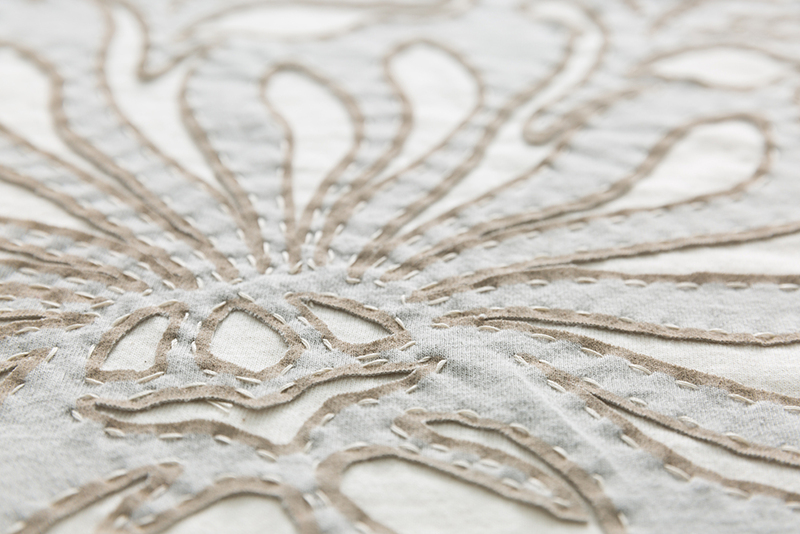 Interested in learning this delicate hand-stitching method? You're in luck! 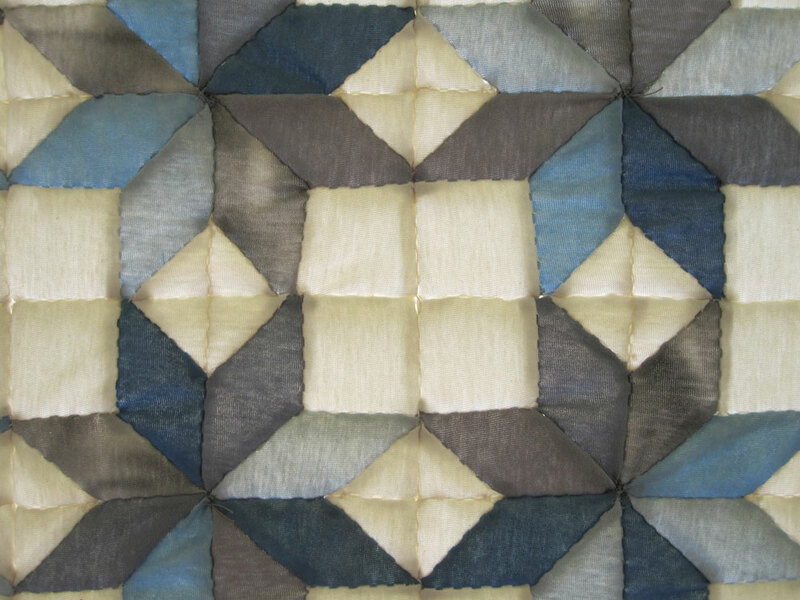 Alabama Chanin has published multiple books on the subject including this one – Alabama ﻿Stitch Book: Projects and Stories Celebrating Hand-Sewing, Quilting and Embroidery for Contemporary Sustainable Style. ​Well hey there Gee's Bend! Don't you know I can't go a post without bringing you up? You're definitely one of my fave groups of ladies and it's hard for me to miss a chance to brag about you. Interested in some other posts about Gee's Bend? Check out this, this and this. You will be quickly infatuated. Promise. 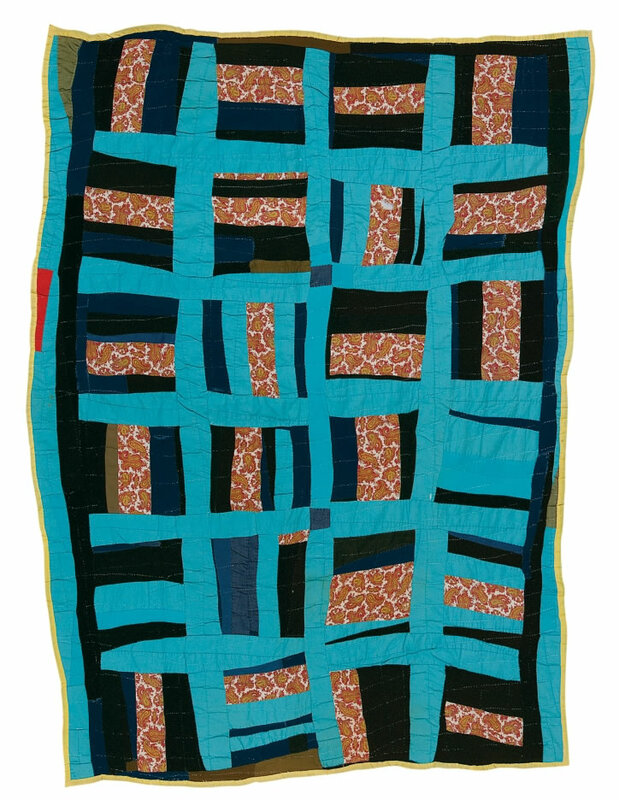 This quilt, like many of the quilts from this group, uses multiple kinds of scrap fabric including cotton twill, jersey knot, denim and polyester. 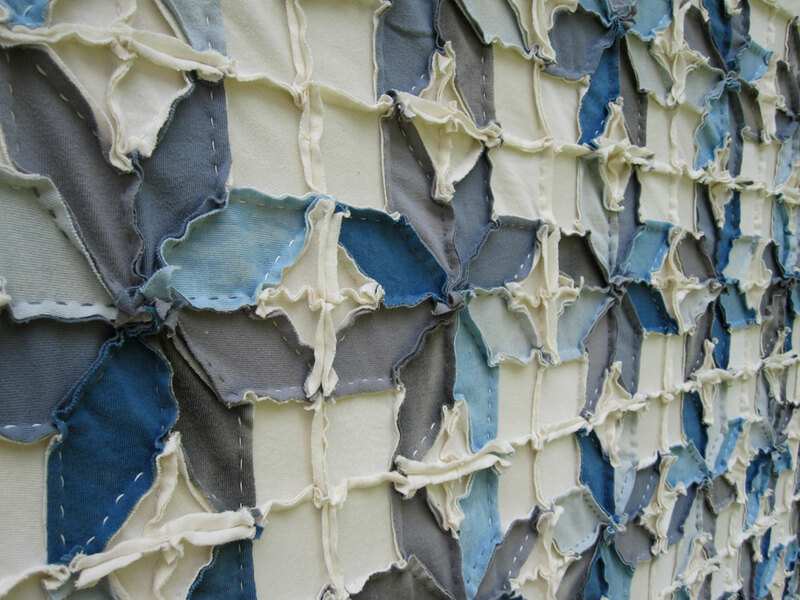 So if you were scared about trying a new kind of fabric, take a page from these quilters and jump all in! Why use just jersey when you can mix it up even more! She's A-mazing and her work makes me drool. Not many people are quilting with jersey, so the examples out there are pretty slim. (Help me out! If you have jersey quilt pics, let me know! )​ I think we can work to change that though. Are you with me?! 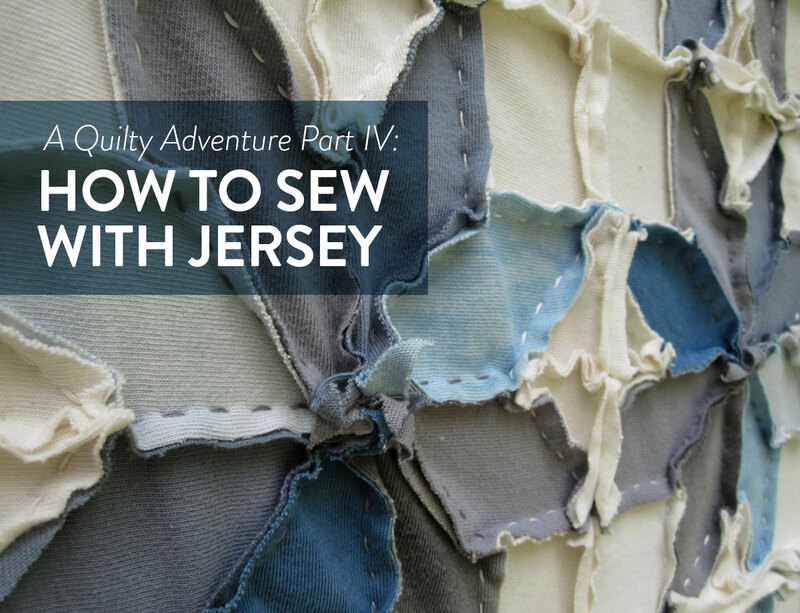 Our jersey adventure is almost over (or maybe yours is just beginning!) but I wanted you to come away with one tricky little souvenir: though jersey knits are just all-around stretchy, they will stretch further one way than another. This can be good to know, as you can rotate your fabric according to your pattern, with more stretch facing the right way. Plus, it kind of makes you feel like jersey knit’s boss. Because you are. Stretch your fabric lengthwise, then width-wise, and make note of the stretchier direction. And then tell jersey that you own it, and not to mess with you. That hand-stitched applique, tho. My word.